Earlier this week, Junior Seau, a former star linebacker for the San Diego Chargers, died of an apparent suicide. Some have speculated that a career of hard hits may have contributed to a string of high-profile suicides by former NFL athletes including Seau. Today, 100 former NFL players have filed a lawsuit against the NFL for failing "to take reasonable steps necessary to protect players from devastating head injuries." 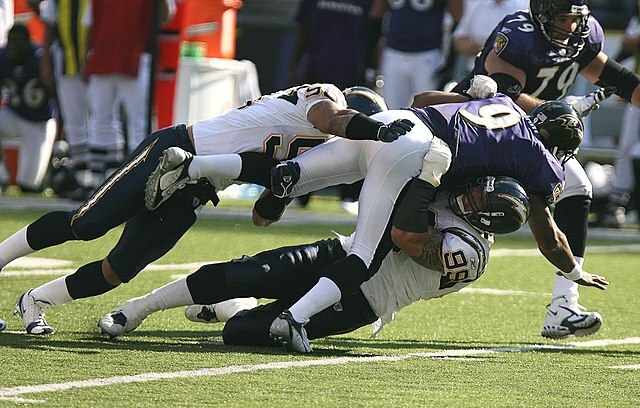 For years, teams of researchers have tried to connect the various forces behind a tackle with the extent of head injuries. This research has led to a better understanding of what kinds of hits cause the most damage -- and what can be done to prevent brain injuries. Image courtesy Keith Allison via Flickr. "Traumatic brain injury [research] has been underappreciated for decades," D. Kacy Cullen, a biomedical engineer specializing in the biomechanics of neural injuries at the University of Pennsylvania, told Physics Central. Recent publicity of head injuries in sports and the military has led to a greater appreciation of this field of research, Cullen added. Cullen's lab has coupled analysis of sports impacts with animal models to better understand the health effects of repetitive minor injuries such as those accumulated throughout an NFL career. Repetitive hits may not lead to obvious signs of structural change in the brain, but they may affect how cells in the brain communicate. "We're gaining a greater appreciation of some of the very subtle changes that are associated with minor injuries," said Cullen. Direct hits to the head can cause serious injuries, and modern helmets have generally done a good job of absorbing impact forces that can fracture skulls. Repeated concussions throughout a career, however, may often stem from a different kind of impact. Certain angles of impact can lead to abrupt rotational forces in the head. The resulting rotation of the head is one of the primary causes of closed head traumatic brain injury, according to Cullen. Rotations around different planes can lead to different biomechanical parameters and injuries varying in severity. Despite research indicating the importance of these rotation, modern helmets don't absorb rotation well. Helmet standards aren't designed to dampen the blow of forces that cause rotation, and a breakthrough in helmets could come if they accounted for these forces, said Cullen. Although there is room for improvement, researchers attempting to prevent injury have had difficulty adapting to changing playing styles. As more players lead with their helmet during a tackle, for instance, they become more vulnerable to injury. "There's an arms race between better protection and evolving techniques," said Cullen. To keep up with Hyperspace, AKA Brian, you can follow him on Twitter.